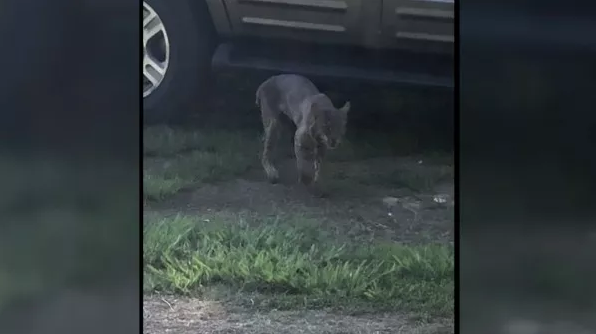 A Georgia grandmother was stepping outside her home to take a picture when she was attacked by a rabid bobcat. Dede Phillips said she had just put the bumper sticker "women who behave rarely make history" on the back of her new truck and wanted to snap a photo when she was confronted by the animal, reports CBS affiliate WGCL-TV. "As soon as it took the first step, I was in trouble and I knew it," said Phillips,"... it leaped on me ... I grabbed it by the shoulders and pushed it back away from me ... and I took it down." Phillips said she was able to get her hands around the animals throat and strangled it, "If I had ever let it go, it would have been me, so I made sure I never let it go." To add to the terror of the attack, her 5-year-old granddaughter was sleeping inside her home. "I started praying, don't let her come to the door," Phillips told WGCL-TV. She didn't scream during the fight, for fear of waking her grandchild. The battle left Phillips with broken fingers on both hands and bruises and cuts on her body. But, worst of all, she must get a painful and expensive series of shots to ensure she doesn't contract rabies from the bobcat. The first round of shots has already cost her $10,000. Phillips' cousin has launched a fundraising effort to help her pay for the medical expenses which has already raised more than $26,000 as of Sunday night.